On September 10-19, Azamat Alibaev ‘04 and Altynai Klimova ‘14 implemented the project Spell It Like Beckham for over 100 teenagers from the urban neighborhood of Dordoi. Regarded as one of Asia’s greatest markets, the Dordoi Bazaar is the capital’s largest center of employment and commerce. Yet living conditions around the bazaar are poor and few educational opportunities are offered to teenagers. The ten-day combined training in English and sports aimed to motivate young people in the area to become more proactive and career-oriented. 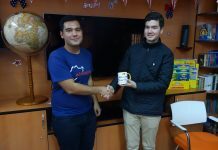 The project partners, the Dordoi Sports Center, the TOEFL Center, and the Evangelical Baptist Church of Bishkek, contributed greatly to the training by providing a football field, English language certificates, and free lunch for participants. In the run up to the project, Azamat visited local schools where he shared the project idea with school administers and hung training announcements in the lobbies. ‘Originally 44 students registered to participate, but on the first day the turnout was almost three times bigger. Sixty-five students attended most activities and qualified for the final tournament,’ shares Azamat. The schedule of the training was busier than the surrounding Dordoi Bazaar itself! Over the course of ten days the participants had regular football practice, took part in interactive English classes, and attended discussions on the topics of time management, teamwork, prevention of street violence, and healthy lifestyle. At the end of the project all of the participants received team photos, participation certificates, and English language exercise books. 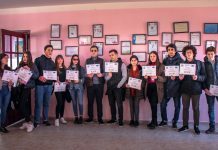 Moreover, the top participating students in the categories of ‘Best Player’, ‘Best English Accent’ and ‘Best Speaker’ were awarded with one-month TOEFL certificates and the libraries of participating schools received English language literature. The organizers believe that the Spell It Like Beckham program will have a positive long-term impact on the Dordoi community. As a result of the project, fourteen participants have continued to study English at the TOEFL Language Center and many have decided to practice sports further. 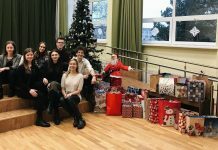 Azamat is confident that the FLEX-Ability Workshop gave him the necessary skills to develop the project and plans to implement the same training for young people of Dordoi neighbourhood again next year.